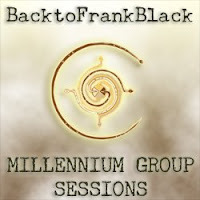 BACKTOFRANKBLACK.COM: BacktoFrankBlack: Millennium Group Sessions starts TOMORROW! BacktoFrankBlack: Millennium Group Sessions starts TOMORROW! BacktoFrankBlack is proud to announce the first episode of their brand new podcast service available from tomorrow on ITunes and through backtofrankblack.com. Enhanced Podcast for Itunes and Ipods with exclusive embedded images (15MB) that will be available for FREE from the Itunes store or direct link from our website. Full high quality MP3 (60MB) again available for FREE on our website. This version will contain no images but will be a high quality audio file. The first pilot episode of this service will contain a broad spectrum of information concerning the campaign, Millennium, its cast/crew and beyond. These podcasts hosted by myself, Jim McLean and Troy Foreman of ThaDarksideVibe. They are an informal affair aimed to be entertaining as much as informative. Props will also go to Mark Hayden, our news/promotions agent who provides much support for the show. The first one will be 60 minutes and available tomorrow. Keep an eye on ITunes and this blog for more details! 0 Responses to "BacktoFrankBlack: Millennium Group Sessions starts TOMORROW!"